Texas Sheet Cake is quite popular here, and for good reason. It takes about 20 minutes to bake, doesn’t require an electric mixer, and because you ice it while hot, it can be baked and served in an hour. But even if Texas Sheet Cake were difficult, it would still be special because of the icing. That’s the best part! It’s shiny, sets up like fudge but is soft on the bottom and flaky on the top, and can be made with or without nuts. As for the cake, it’s usually made in 15×10 inch pan, always calls for either buttermilk or sour cream, and can be made with or without cinnamon. Lady Bird Johnson’s Mexican Chocolate Cake, which some claim to be the original Texas Sheet Cake, is made with cinnamon. This weekend I made a Texas Sheet Cake. I thought about taking it to my family at Lake LBJ, but the cake is my sister-in-law’s “thing” and I didn’t want to infringe. She ended up bringing cookies, so now I wish I’d taken it, but hey – more for us. And by more, I mean a whole 15×10 inch cake. If you want to half the recipe, give it a try. If I were halving it, I’d use a 9 inch square pan. Here are a few more photos. They were taken in different light, but I think they give you a good idea of the texture — especially that of the icing. Update: I recently tested this recipe in a Nordicware half sheet pan with lid which measure around 12×17. The cake was a lot thinner and bake time was exactly 15 minutes at 375. Perfect Texas Sheet Cake with a smooth, glossy, fool-proof frosting. If you'd prefer a sour cream frosting, see the note on how to make it. I usually like the milk frosting, but one day I was out of milk and used sour cream instead with good results. For the sugar you can use 2 cups of white or sub 1 cup of brown for 1 cup of the white. If using the brown sugar, melt the brown sugar with the butter/water/cocoa mixture. Preheat oven to 375 degrees. Grease a 15x10 inch jelly roll pan. Mix the flour, sugar, salt and cinnamon (if using) in a large mixing bowl and set aside. Melt butter in a medium size saucepan. Stir in the cocoa powder and water and bring to a boil. Pour the boiling cocoa mixture into the bowl with the flour mixture and mix with a spoon until blended. In a second bowl (or you can just use the saucepan -- no need to even clean it), whisk together the eggs, vanilla, buttermilk and baking soda. Add the egg mixture to the cocoa mixture and stir until blended – do no overbeat. Just do your best to blend the ingredients. Pour batter into the pan and bake for 20 to 25 minutes (check at 15), or until a toothpick inserted into center of cake comes out clean. As soon as you pull the cake from the oven, start the icing. To get a head start, you might want to sift the sugar while the cake bakes. Icing: Sift the confectioners’ sugar into a mixing bowl and set aside. You can skip the sifting step if you must, but sifting helps it to blend easier and the icing will be smoother. 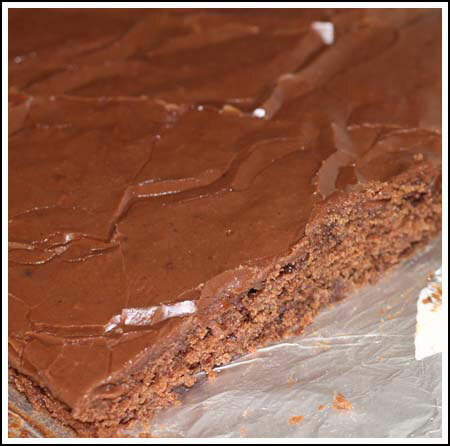 I've tested this recipe in a 15x10 inch pan as well as a half sheet pan measuring about 12x17, Both versions are great, though the 12x17 only takes 15 minutes and gives you a much thinner cake. For the icing, I've also tested a sour cream variation. For the sour cream variation, sift about 14 oz of flour into a bowl and set aside. In a large saucepan melt 1/2 cup unsalted butter along with 1/4 teaspoon salt. Stir in 1/4 cup cocoa powder until smooth, then reduce heat to very low and stir in 1/3 cup sour cream. Remove from heat and stir powdered sugar into warm chocolate mixture 1 cup at a time. Stir in 1 teaspoon of vanilla. Carefully pour and spread over cake. I have made this cake many times! My grand-daughter loves this cake also. Her Birthday is coming up in July, this is the cake that she wants! I have gotten everything ahead, so I will have everything to make this, a day ahead, the Frosting is the best part. I put it on when the cake is still hot, it takes a lot like Fudge. 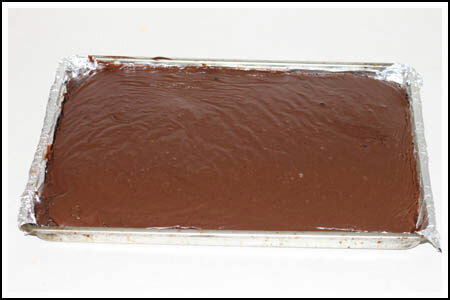 So, if you have never made the Texas Sheet Cake, do try it and see if your family loves it. Shannon, thanks for noting the bake time. I’ll add a reminder note to check at 15. I have a feeling people will play around with pan sizes, so I really should include a range. I made this today…I noticed that the cake baked in less than 20 minutes … more like 15-18…looking forward to eating it with that scrumptious icing…my Mother made this cake for many family gatherings! My mother – in – law has made this cake for years. She has never stored it in the fridge or freezer. It keeps fine on the counter for several days – if it lasts that long! This is a great fool proof recipe. I made several for a group of soldiers and it disappeared immediately. I have never made it with any liquor though – what a great idea! Next time, I will sub chocolate liqueur for the H2O. Does anyone know how far ahead of serving this cake may be kept unrefrigerated and still keep its quality? It is so big that I can’t store it in the fridge or freezer. Since you posted this recipe I have made this cake numerous times and everyone LOVES it! So quick and easy to make and and that bit of cinnamon makes it unique. I make this & add a cup of mini marshmallows & chopped walnuts to the topping. I have also made this with a touch of Kahlua in the cake. I loved it, my grandchildren did not!! This cake is so good! My mother make a cake very similar to this but she calls it Royal Crown Cake. She used Royal Crown cola instead of the water and adds miniature marshmallows. So glad to see this recipe posted!